A question was asked recently on a Facebook status update about how can you ensure your post is seen by the largest amount of the online community. Apart from writing a blog post or some other piece of content and linking to it on Twitter or creating a press release and publishing it, in this instance it was in relation to content on Facebook itself. In Facebook it is all about ‘reach‘ and ‘visibility. And, it’s Facebook Edgerank that makes it possible. Part of the answer could well be that many of your fans, if posted on your Facebook business page, or friends in your personal stream, may not have even seen your post due to the introduction of Facebook’s EdgeRank algorithm. 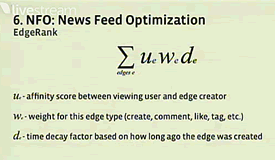 Facebook’s EdgeRank algorithm is a subject that has been getting a lot interest and discussion in recent months. It’s effect may have seen some brands’ Facebook pages receiving less Likes or Comments posted as previously seen prior to its introduction. Edgerank is a relative measure, similar to Google’s PageRank, which tries to determine the perceived value and relevancy of individual posts & updates. Facebook uses it to grade every post, status update, picture and video you add to your Facebook wall. EdgeRank assigns a score to each of these individual posts and is used as a relevancy metric that considers the way in which a particular user is regarded by their network of friends or fans. It’s purpose is to determine what appears at the top of peoples News Feeds and used by Facebook to create a subset of the ‘Top news’ content shared within a users’ network. 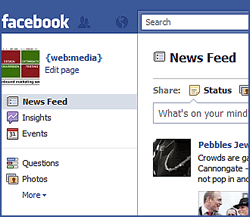 It is effectively an automatic filter that becomes the ‘Top news’ tab displayed on Facebook’s homepage. It’s important to optimise each type of content to make sure that posts get shown in the ‘Top news‘ stream. The exact make-up of the formula (like Google’s search/pagerank algorithm) is not disclosed but the elements it uses are. It is known that it looks at three factors: affinity (the strength of social ties between a person and a page), weight (how many Likes and comments the page or piece of content has attracted) and time (how recent the content is). EdgeRank also factors in the quality of user engagement to assess the popularity or newsworthiness of the particular piece of content and is not determined by the number of friends you or likes your page has. You or your business page might have a million friends/fans, but unless you are engaging with them, you are unlikely to appear as a top news item in their stream. You might even have noticed that status updates you have made don’t even seem to appear in the top news of your own stream and appear lower down the page, often below the fold, where it might not be seen at all unless the visitor is prepared to scroll (not something they might do a lot)! EdgeRank is weighted so that activities that require higher levels of user engagement get a higher score than those that don’t. As an example, Comments are rated higher than Likes as more effort, thought and engagement is needed to comment on a status post than simply clicking the Like button. Making comments is also more likely to continue to take the conversation forward, increasing the relevance of the status update, being seen by a greater number of Facebook users and in turn expand the posters reach and visibility. As EdgeRank rewards more recent content, and affinity builds up over time, posting only rarely and sporadically on your Facebook page will not help to get your ‘news’ into the news feeds of your friends or fans. For Facebook page posts the objective for marketers is firstly to attain the most likes and then to encourage comments increasing a post’s EdgeRank. When someone comments on your Facebook page they are effectively sending an invitation to continue the conversation. That in turn encourages re-shares and exposes your content to more of the friends of fans. So, instead of just focusing primarily on attracting Likes, important as that is, Facebook marketers need to encourage visitors, friends and fans to comment on and share their content to boost Edgerank. Marketers need to create posts that will engage with their audience and invite both Likes and Comments. To increase your page’s exposure on Facebook, content must be tailored and the frequency of updates maintained to help increase your page’s EdgeRank. Doing that is no different that any other form of inbound marketing; it involves producing interesting, informative, sometimes controversial or opinionated content, be that on Facebook or your blog. Also, there is considerable evidence to suggest that different actions, content postings and types of posts contribute to a higher EdgeRank. Content need not just be textual post but should include video, images/pictures, slideshows, podcasts, links to other relevant information, downloads and there are many others but the important element is doing it and focusing it on the interests, expectations and needs of your target audience. You can check your page’s Edgerank with a free service here: http://edgerankchecker.com/. All that is needed is to login with Facebook to find out. What’s your Facebook Edgerank? Let us know in comments below.